Technologies for removing carbon dioxide from the atmosphere are unlikely to offer an economically feasible way to slow human-driven climate change for several decades, according to a new report. The American Physical Society has released a new assessment -- Direct Air Capture of CO2 with Chemicals -- to better inform the scientific community on the technical aspects of removing carbon dioxide from the atmosphere. May 12: The National Research Council has released the final report of America's Climate Choices. The report is available now through the National Academies Press. It includes a CD of the four panel reports of the America's Climate Choices series as well as materials based on those reports. Several members of the report's authoring committee discussed will discuss the findings in A Conversation on America's Climate Choices on May 12 (see details below). A video recording of that discussion will be posted on Friday, May 13 on this site. The report finds that the significant risks that climate change poses to human society and the environment provide a strong motivation to move ahead with substantial response efforts. Current efforts of local, state, and private sector actors are important, but not likely to yield progress comparable to what could be achieved with the addition of strong federal policies that establish coherent national goals and incentives, and that promote strong U.S. engagement in international-level response efforts. The inherent complexities and uncertainties of climate change are best met by applying an iterative risk management framework and making efforts to: significantly reduce greenhouse gas emissions; prepare for adapting to impacts; invest in scientific research, technology development, and information systems; and facilitate engagement between scientific and technical experts and the many types of stakeholders making America's climate choices. We can no longer exclude the possibility that our collective actions will trigger tipping points, risking abrupt and irreversible consequences for human communities and ecological systems. We cannot continue on our current path. The time for procrastination is over. We cannot afford the luxury of denial. 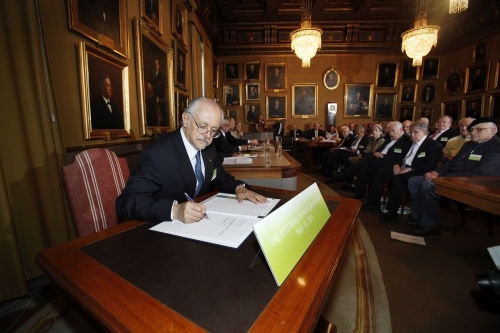 The memorandum was handed over to the members of the UN high-level panel on global sustainability, who traveled to Stockholm in order to discuss it with the Nobel laureates and experts at the symposium.